I can’t stress enough just how big a deal the UK’s transition to Open Banking is. The writer Wendy Grossman posted an excellent piece about this in her “net.wars” series recently. She said, without exaggeration in my opinion, that the “financial revolution” coming here in mid-January has had surprisingly little publicity perhaps because “it’s not a new technology, not even a cryptocurrency. Instead, this revolution is regulatory: banks will be required to open up access to their accounts to third parties”. As Wendy notes in her piece, Wired had a great article about this (written by Rowland Manthorpe) in October. Having talked to some of the key players and examined some of the key concepts, he draws an important conclusion, which is that open banking is not “just a technical fix, or even a solution specific to banking, but a new way of dealing with the twenty-first century’s most sought-after resource, personal data“. He is spot on. Identity is, as some people maintain, the new money. Banks are about to be transformed from places that store digital monies (which they really don’t anyway, since the proportion of household wealth held in the form of demand deposits has already fallen to minuscule levels) into places that store digital identities. Now, this is hardly a new idea and it isn’t only techno-crackpots like me who keep going on about it. Back in 2014, the Financial Times was reporting that “Britain’s high street banks believe their future role will be as repositories of more than just money: they want to be the safe place where customers store their digital identities”. This makes complete sense as a strategy and as a European Banking Association (EBA) white paper of the time put it, “banks are well positioned” to be a crucial, supporting, positive part of their customers online lives. Banks know this to be the case, they just haven’t done much about it. I still can’t use my Barclays identity to open an account at RBS, much less to log in to Direct Line or Bet365. Since that FT piece, some people (uncharitable persons, of whom I am not one) have suggested that banks will pratt about and muck it all up and hand digital identity on a plate to Apple, Facebook, Google, Amazon and Microsoft (the GAFAMs). Well, we’re going to start finding out in January, because I can’t help but feel that the major beneficiaries of the regulators pressure to open up the banks will not be nimble fintech startups but the internet giants who already have the customer relationships. Rowland speculates that open banking may expose some institutions to change and to competition that they simply cannot respond to. He even goes as far as to suggest that banks may well fail because of it. This is the sort of thing that they must have been mulling over down at Open Banking Limited, the entity set up to implement open banking in the UK, where the Implementation Trustee, Imran Gulamhuseinwala, “doesn’t seem to have much sympathy for failing banks”. Now, having met Imran at dinner (with the Russian Ambassador, as it happens) I can confirm that he is one smart cookie (and a very nice guy too). He’s got a point about the competition that open banking should unleash, but when RBS goes under because all of its customers have shifted to Facebook and the bank becomes a low-margin heavily-regulated pipe that is not operationally-efficient enough to compete only on price and service levels, I suspect others may have a different perspective. 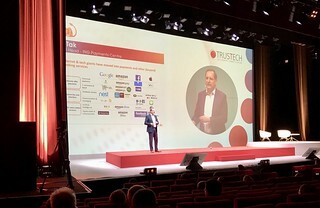 Either way, I agree with Erik Tak, Head of the ING Payment Centre, who said at Trustech in Cannes this year (below) that the people who will benefit most from this opening up of retail banking will not be fintechs but those GAFAMs mentioned earlier. Wendy’s words are well chosen. Open Banking is a revolution, and all we can say for sure is that there is going to be change. But as to who the winners and losers are… well, the UK is about to become an interesting, exciting and unpredictable laboratory experiment in banking regulation. In a year or two, we may at least have a signpost to the future of retail banking in place.